Lose yourself in paradise at TreeHouse Villas Koh Yao! 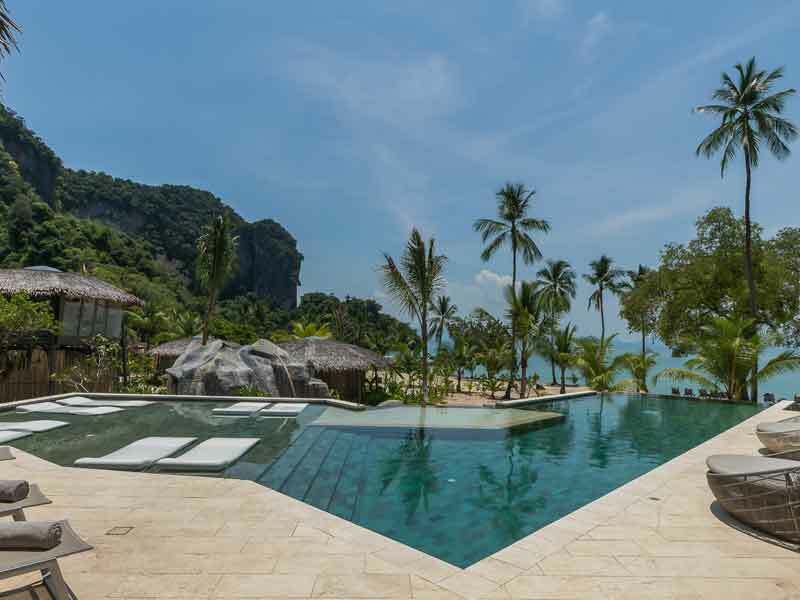 Set on the hilltop overlooking the stunning Phang Nga Bay, this lush, luxurious resort is everything you’ve ever wanted in a tropical adults-only retreat. Set out on the road less travelled, reacquaint yourself with nature and take the time to completely unwind. Whether you holiday to escape, discover, get active or indulge, TreeHouse Villas Koh Yao is the adults-only retreat just for you! Set amongst a luscious jungle canopy and surrounded by exquisite ancient natural wonders, guests can quickly forget the bustle of the Western world. Breathe in the fresh air and completely relax. TreeHouse Villas Koh Yao boasts all the features of a tranquil, sophisticated retreat, yet it still manages to offer a holiday like no other. The accommodation, for one, will completely blow your away. There are two room type offerings to choose from and each are sprawling and unique. Enter over a suspended bridge to your multi-story TreeHouse Villa or wake up directly on the water’s edge in your Beachfront Pool Villa. Boasting between 91 and 110sq. metres, separate living and sleeping spaces; Wi-Fi; in-villa dining, spas and yoga sessions; air-conditioning; plush King bedding; direct beach access and so much more, you’ll never want to leave these absolute jungle palaces, perfectly designed just for two! If you do venture out of your stylish, up-cycled abode, enjoy the other features at the resort. These include the day spa (overlooking a lily pond and complete with steam room, cooling pool, massage and personal body treatment rooms); Thai cooking classes; Batik painting lessons; land and water sports (volleyball, badminton, table tennis, snorkelling, kayaking, mountain biking, trekking and fishing); evening entertainment shows and a range of incredible dining opportunities. Choose between delicious meals and poolside drinks at Roots, contemporary and Mediterranean-inspired meals at the Al Fresco beachfront restaurant, live music and unbeatable bay views at Sundowners bar, tailored candlelit dinners on the beach or in-villa dining, where absolutely everything can be delivered and expertly plated in the comfort of your home away from home! 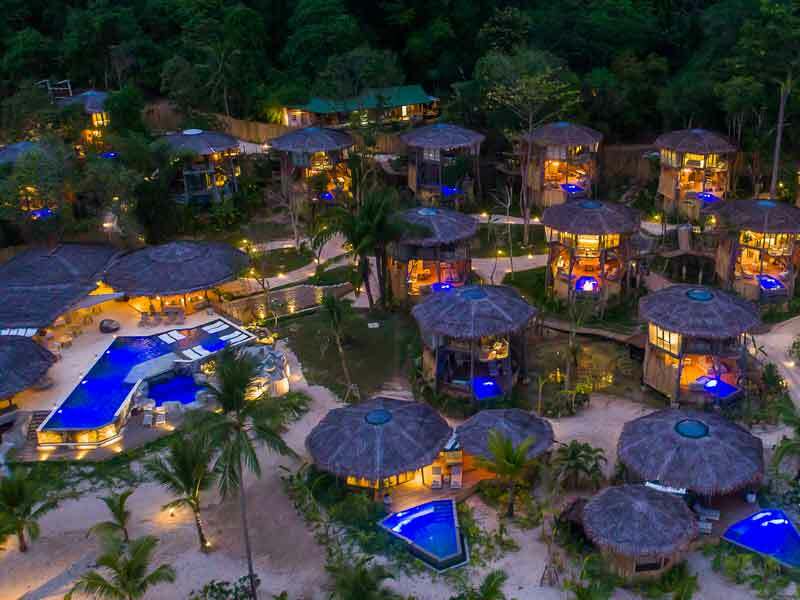 Why Go to TreeHouse Villas Koh Yao? TreeHouse Villas Koh Yao is set on the remote, northern most tip of Koh Yao Noi—the “Little Long Island”. Being located on one of the last remaining local islands in the region to remain largely unspoiled by mass tourism, the resort is surrounded by absolutely breathtaking vegetation. In fact, a large portion of the island is dedicated to national parkland, meaning that you’ll experience nature as lush and untouched as it always has been! Escape the crowds of Phuket and Krabi, overdose on the scenery and enjoy a tranquil island retreat like no other. TreeHouse Villas Koh Yao is accessible only by boat. It is secluded and peaceful, but, once there, you’ll find everything you could ever wish for in a luxury hotel! Remember how great treehouses were when you were little? Imagine being able to relive that magic but with added Thai luxury! At TreeHouse Villas Koh Yao, you can do just that—simply check-in to an up to 110sq. metre TreeHouse Villa and let the fun begin! Accessible via suspended bridge, these multi-story villas are surrounded by lush jungle vegetation and offer incredible bay views. Enjoy free Wi-Fi, direct beach access, a private plunge pool, double swing, sofa and day beds. High ceilings and unique-yet-stylish up-cycled design elements dominate the interior space. 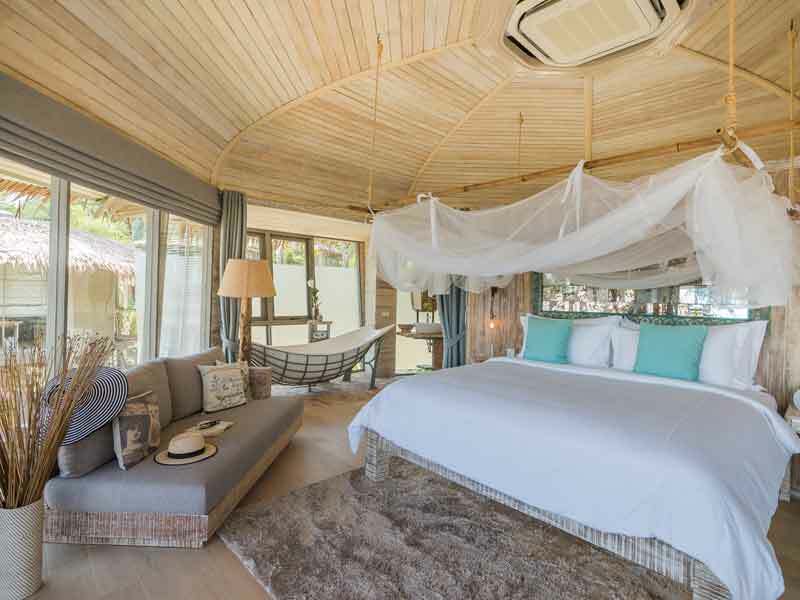 The upper floor is air-conditioned and features a grand King bed, a balcony that appears to float over the surrounding jungle canopy, a custom hammock-shaped bath and a jungle shower. Downstairs, enjoy in-villa dining, yoga and massages or take a plunge in your pool (set into the open-plan living/dining area). With a personalised, complimentary bar; aromatherapy herbal oil burner; Bluetooth music station; SMART TV and more, up to 2 guests can relax and unwind in style here! Direct beach access and your own 7-meter pool? Yes please! Set on the water’s edge, these exquisite Beachfront Pool Villas offer up to 110sq. metres of space, two separate living/sleeping areas and an absolutely mind-blowing dose of natural island beauty. Wake up to gaze upon the Krabi island coastline and admire the stylish, up-cycled design flare that decorates the interior of your space. 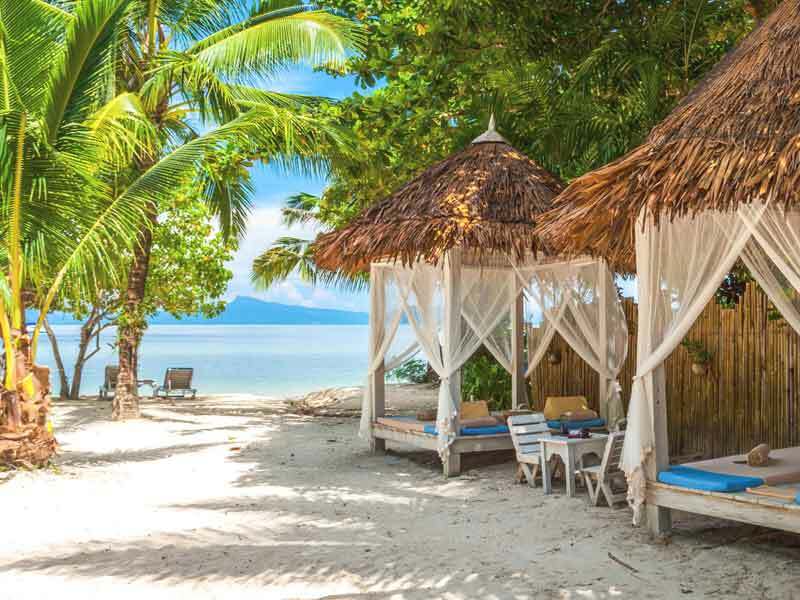 Complete with an air-conditioned bedroom, grand beach-facing King bed, large custom hammock-shaped bathtub, jungle shower and personalised complimentary bar, you’ll be able to relax and unwind with ease! Other features include free Wi-Fi, a 42” SMART TV, Bluetooth music station, smart door lock system, a teakwood ceiling fan, an aromatherapy herbal oil burner and so much more. Beachfront Pool Villas are surrounded by lush jungle vegetation and are perfect for those wanting to soak up the sun, in privacy, by their own sparkling pool or on the glorious stretch of beach. They can accommodate up to 2 guests. TreeHouse Villas Koh Yao is located on the northern tip of Koh Yao Noi—the tranquil Thai island in Phang Nga Bay. 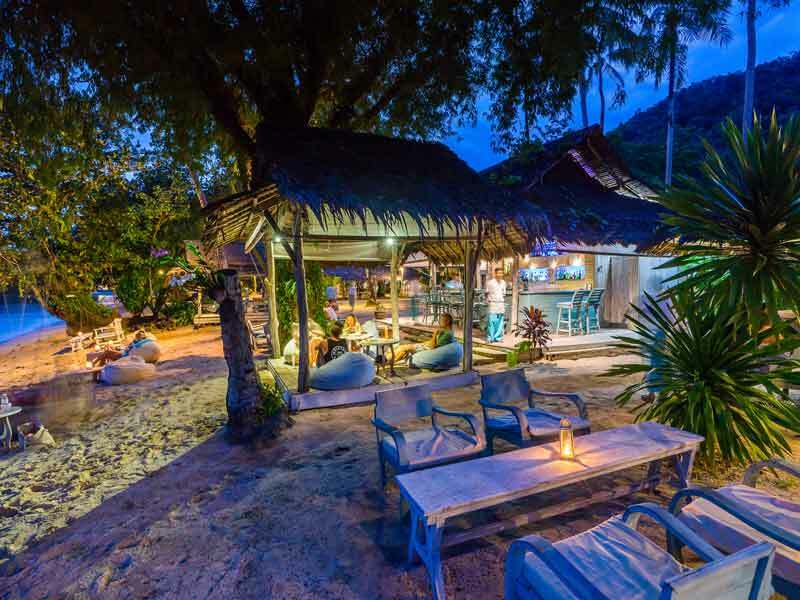 Set between the popular tourist islands, Phuket and Krabi, this stunning island offers a peaceful alternative, where nature and relaxation are heroed! Koh Yao Noi can be accessed via a VIP speedboat, a resort-scheduled boat transfer or public ferry service. The speedboat journey takes less than an hour, but once you get there you’ll feel a million miles away! 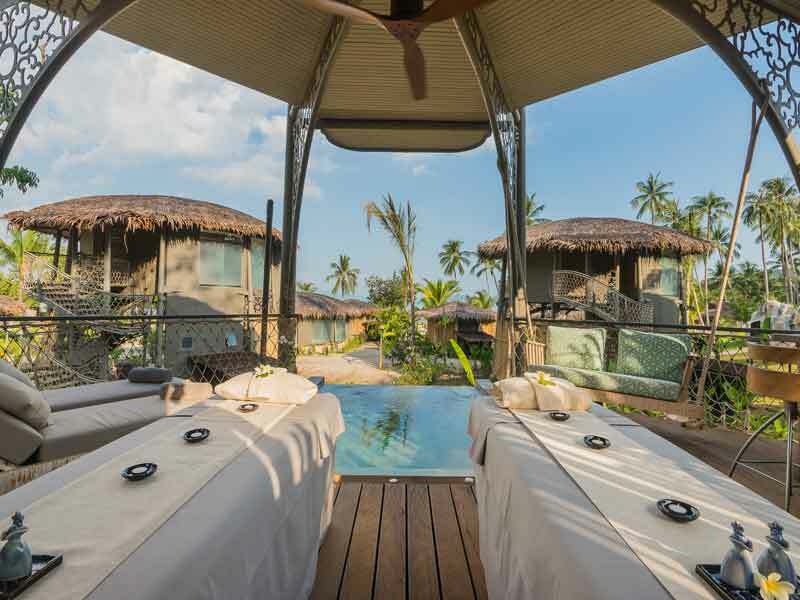 Breathe deep and completely unwind at TreeHouse Villas Koh Yao! Whether you want to spend all of your time in your one-of-a-kind accommodation, basking in the peace and each other’s company, or if you want to explore, you’ll never have a dull moment here! 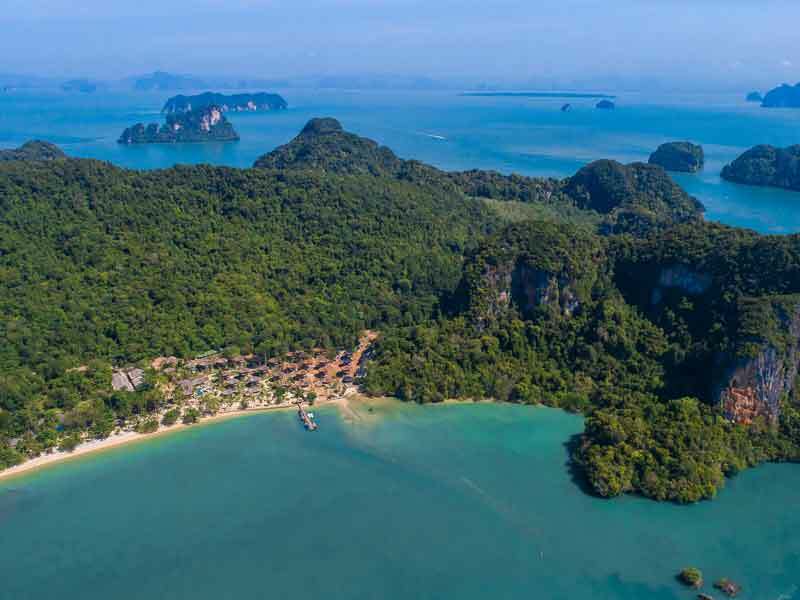 Aside from health and wellness activities, either in your villa or at the spa, guests can dine, be entertained, get active with land sports, or paddle toward the ancient Jurassic massifs (stunning rock-island formations) of Phang Nga Bay. In terms of wider island-based activities, guests can embark on a jungle trek or go mountain biking along the rustic, unsealed road that leads from the resort to the interior of the island. Take a longtail boat to Tha Khao village and pier, hire motor scooters there and explore. If you’d rather explore in an organised group, there’s shopping, village and elephant trekking tours on nearby Phuket and Krabi, which resort staff can help you arrange! Truly unique and spectacular in every sense of the word. From the stunning island location to the comfortable, spacious atmosphere of the rooms. It is magical to be surrounded by nature and live above the trees to enjoy endless ocean views. A breathtakingly special experience. Perfect for honeymoons and romantic getaways.